I awoke this morning to the sound of the mobile phone alarm playing the drinking song from La Traviata. I’m not sure whether to change the tune or stow a bottle of grog next to the bed. I am considering both. Pip the orphaned pademelon pops in occasionally. She appears hale and hearty, although it can be difficult to tell the real condition of wild animals. They tend not to let on. She has taken a dislike to the brush turkeys. If one approaches while she’s grazing, she will hiss at it. It is a remarkably loud hiss for such a small animal and unmistakeably threatening. Should the turkey not heed the warning, Pip will stand up and do it again. The second time, the hiss comes with an undertone of Ray Winstone and more than a hint of Vinnie Jones. This usually causes even the most fearless bird to find a sudden interest in ooh, let me see, this thing over here looks interesting. But every now and then, a courageous or possibly thick turkey persists in its approach. Then Pip gets angry. And jumps at them. See Pip jump. Jump, Pip, jump. See turkey flee into the scrub. Run, wimp, run. To us, she’s a cute little furry thing with big hind feet and doe eyes. To them, she’s a cute little furry thing from Hell. I was going to post some of the latest news stories from the Far North, but I couldn’t find any. This piece isn’t actually news nor is it from the Far North, but it involves three lucky anglers unexpectedly encountering a whale shark off Townsville. There’s also this from ABC local radio: CSIRO unveils bootylicious Beyonce fly. Stunning Creature the Whale Shark.... what an honour for the boatmen to experience the moment... repeatedly... Awesome. Do you ever consider your shared life amid the wildlife being like a Beatrix Potter type of life story Snail? I know when I read your descriptions I always feel rapture take hold... what a wonderful way to be living your life Snail, and always a treasure to experience the moments you share. bootylicious!!!! what a name, regardless of the Beyonce part. 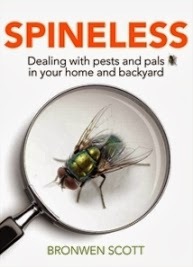 I recently listened to a chat time about flies on ABC... they may be a pest, but on the whole do much good for the environment... without them there would be a lot of resulting problems which includes disease issues. Cool in our part of Queensland, even overcast today Sat14th. Magda, those guys were so lucky to have that experience. I don't think it's all that common in that area. It's not a bad life at all here. I do need to focus a bit more on earning money though. It's something we all have to do! I quite like flies. Not so fond of horseflies, I must admit, but without the garbage disposal kind, we'd all be in deep...er...trouble. Patricia, thanks for that link. I had no idea they dived so deep. They're quite a tourist attraction on the W coast of Australia. I don't think the gatherings are as big as the Yucatan ones. I wonder if it would be greedy to put both of them on my 'to do' list? a bootylicious golden behind!!! haha!! i would certainly be honored to have a fly...or anything...named after me...even if it was in honor of a body part!! ha! here's hoping you get a heat break soon...some rain...SOME...not too much at once! have a good week snail!! The entos described several other flies in the paper, including one that I think is just as pretty (for a biting fly) as the Beyonce one. Instead of having a golden bum, this one has streaks down its sides. The specific epithet translates as 'gold lightning'. Whale sharks are ginormous, but are plankton feeders, thank goodness! Still, they could probably do a bit of damage if they took a set against a boat. that's good to hear...they're vegetarians! still...it would be a little nerve wracking to see something so huge swimming next to or under the boat you're in! Sorry about the connection. Maybe there's a geoblock on it? I will see if I can find an alternative. Okay, here's the youtube link. I should've just embedded it.